Cebu City (23 September) -- According to the DOH-7 report, majority of these dengue cases came from Cebu City with 26%, followed by Tagbilaran City at 6.2%, Lapulapu City at 4%, Dumaguete City at 4% and Toledo City with 3.1 percent. The top 10 municipalities/ cities with dengue cases and deaths in Central Visayas are Cebu City with 1844 cases and 15 deaths. Tagbilaran City had 443 cases and 3 deaths; Lapulapu City with 283 cases and 2 deaths while Dumaguete City had 270 cases and 2 deaths. Toledo City and Talisay City had 224 cases and 1 death and 215 cases and 2 deaths respectively. Danao City on the other hand had 160 cases with zero deaths. Mandaue City had 136 cases and 4 deaths; Naga City with 138 cases with zero death, and Sibulan with 125 cases with one (1) death. 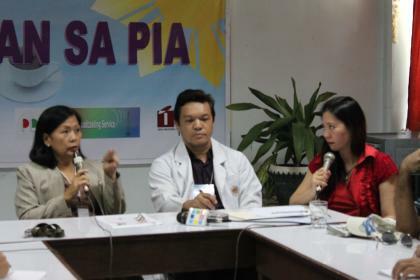 The areas of concerns which DOH classified as Epidemic Thresholds are barangays Guadalupe, Labangon, Lahug, Tisa, Apas and Talamban in Cebu City; Barangay Basak in Lapulapu City; Barangays Sangat and Poblacion in San Fernando, Cebu Province. In Tagbilaran City barangays Cogon, Dao and Taloto are also classified as within the Epidemic Threshold including the barangays of Daro, Looc, Poblacion and Taclobo in Dumaguete City and Barangay Bolocboloc in Sibulan, Negros Oriental. Hotspot areas in Cebu City are Banawa, Punta Princesa, Sambag II and Talamban. In Tagbilarn City are Bool, Dampas, Manga and Poblacion II. Barangays Looc and Pajo in Lalulapu City; Lagtang and Lawaan in Talisay City; Tinaan and Ulin in Naga City; and Barangays Bagacay, Banilad, Camanjac and Piapi in Dumaguete City are also considered as hotspot areas. With the current Dengue trends, DOH encourages all local government units to intensify information campaigns on dengue emphasizing on the importance of eliminating the breeding grounds of mosquitoes and mobilize the community to actively participate in environmental sanitation drives such as the Barangay Brigade Campaigns. Madarieta recommends 4S as effective measures in fighting dengue. First is, Search and Destroy. She asked everyone to clean up containers that holds water that would eventually be breeding places of mosquitoes e.g. used tires, cans, bottles, bottle caps (tansans), plastics receptacles, uncovered drums, roof gutters, dish drainers, refrigerator drainers, washing machine drainers, coconut husks, bamboo fences, leaves of bananas and bromeliad plants. The insides of flower vases must be scrubbed thoroughly once a week. She said the aedesegypti mosquitoes carrying the dengue virus do not thrive on dirty waters like creeks and canals. These mosquitoes breed and thrive on shiny and dark places. Secondly, Self-protection measures. "Wear long pants and kamisetas at night and use mosquito repellants on daytime," Madarieta said. Thirdly, Seek early consultation. Consult right away to the nearest health center or hospital when one has fever for 2 days and got rashes.